August 6th and 9th of 1945 marked a turning in World War II, and while Japan’s official surrender would not be for nearly a month later the very nature of warfare had changed. Nearly four years after the bombings Hiroshima and Nagasaki the Soviet Union developed its own atomic weapon, suddenly the United States was no longer completely unchallenged. With the possibility of a mainland attack still prevalent in the minds of many Americans as a result of the Attack on Pearl Harbor, the communist threat seemed all the more dangerous. The possibility of destruction of one or both parties through atomic warfare seemed almost inevitable. However, though ingenuity and technical superiority, the United States would spawn a defense network across the continent’s northern, eastern, and western territories as an affront to the Soviet Union, and subsequently lay the ground work for what would become the space race. This ambitious defense network would involve 52 bases, one of which would be designated to Michigan’s Upper Peninsula’s Raco Army Field. A little over 4 miles outside the small town of Raco Michigan lies the decommissioned Raco Army Airfield. Constructed around 1940, and originally designated as the Raco Landing Field, the landing strip was originally used as a civilian landing strip before World War II [Freeman]. However, the looming post Pearl Harbor paranoia and the fear of an impending attack on United States and its assets, such as Sault Saint Marie, generated the need for an immediate military air response capable of defending the nearby area and any potential target in the event of an attack. As a result, the Raco Landing Field was redesignated as the Raco Army Airfield sometime during World War II [Freeman]. 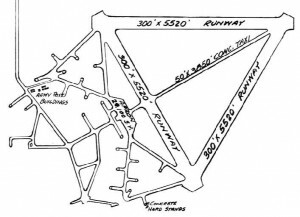 At this point the airfield itself had three distinct landing strips in a triangle pattern which had easterly, southwesterly, and northwesterly landing and departing approaches. Overtime the airfield would acquire armaments such as antiaircraft guns with the intended purpose of defending Sault Saint Marie from an airborne attack [Freeman]. However, like many of the precautions taken by the United States during World War II to prevent a tragic attack like this from happening, an airborne attack on Raco Army Airfield, Sault Saint Marie, or United States never happened. The preparation of this landing field installation would prove useful however, as the United States exited World War II and went into another conflict with the Union of Soviet Socialist Republics (USSR). In response to the increasing threat of the Soviet Union’s atomic capabilities the Raco Army Airfield would again be repurposed to defend against a possible threat. 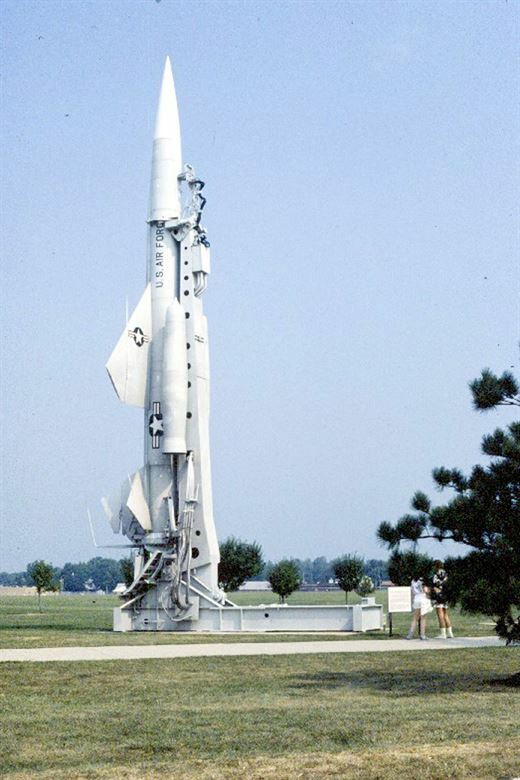 On March 1st, 1960, the base would receive its last and most notable set of artillery from the United States Air Force, the CIM-10 BOMARC (Coffin, Interceptor, Missile, BO – Boeing, Michigan, Aeronautical, Research, Center) surface to air missile [National Museum of the US Air Force]. The word “Coffin” refers to the buildings used to house these missiles, as they would be stored horizontally, and then propped up vertically upon launch [Baugher]. To accommodate these surface to air missiles and their needed infrastructure, it is estimated that Raco Army Airfield would have needed to under go approximately $1,100,000 in alterations according to a report done by the Office of the Inspector General. 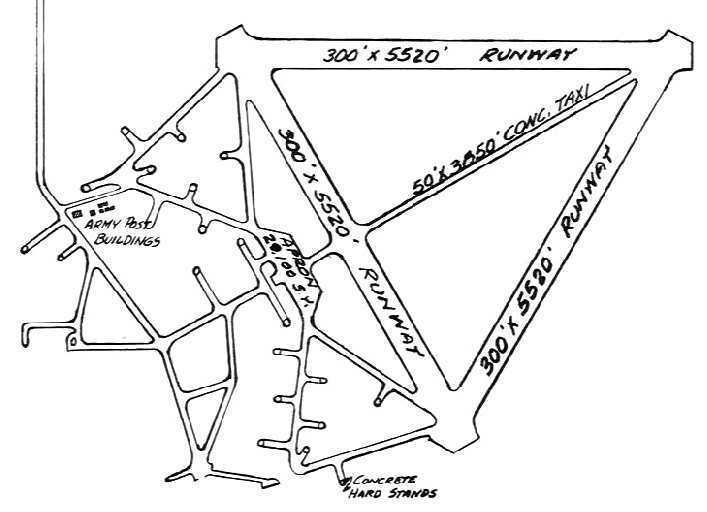 The Raco Army Airfield, now under the command of the 37th Air Defense Missile Squadron, would join the ranks of 52 other bases across the United States, all of which were intertwined in the SAGE (Semi-Automatic Ground Environment) network [West]. The base would continue its mission as a BOMARC facility until it was decommissioned on July 31st, 1972 [Freeman]. While the life of the Raco airfield was vastly uneventful in terms of its intended purpose, the technologies implemented by the base during its lifetime tell another story of Red Scare (fear of communism, mainly of the U.S.S.R.) and the fear of nuclear inhalation. The life and development of the CIM-10 BOMARC and the SAGE communications network started with the need for a joint system capable of detecting and eliminating a surprise attack. The threat of main concern at the time was the Soviet Union. Despite the fact that the Soviet Union was immensely decimated after World War II, the United States knew that it was only a matter of time until the Soviet Union could develop both nuclear weapons and long range bombers to drop them with. Thus, in 1946, the Army Air Force’s Air Materiel Command asked Boeing to design a long range pilotless aircraft. The requirement of a “pilotless aircraft” rather than a full fledged missile is not a typo, but rather a technicality used to pass the program under the jurisdiction of the United States Air Force, and not the Army’s Air Forces [Guttman]. The reason for this nomenclature being that the Department of Defense’s allocation of duties of 1949 outlined that the surface to air missiles and anti aircraft artillery was under the jurisdiction of the United States Army. At the however, the Army was trying to develop a different surface to air missile, the Nike [Guttman]. Thus in order to pass funding and justify both of the weapon systems, the BOMARC was simply referred to as a pilotless aircraft rather than a missile. Boeing would develop the BOMARC with the University of Michigan’s Aeronautical Research Center. In its infancy, the experimental aircraft was referred to as the MX-1599, however the partnership of the two institutions would ultimately change the name to BOMARC [Guttman, West]. Development of the BOMARC was slow. While the technologies in the BOMARC seem fundamental, and almost primitive, to a missile, the technologies required were still in their infancy during the late 1940s. Development of the BOMARC did not reach its full pace until the Korean War, where tensions of between the United States and Soviet Union were strained even more. It would not be until September 10th of 1952 the BOMARC would fly for the first time [Lombardi]. Yet, even then it would take another five years until the BOMARC was mission ready. By the time it was fully developed the BOMARC weighed about 16,000 pounds, had a height of 46 feet 9 inches, and a wingspan of 18 feet two inches [FAS]. 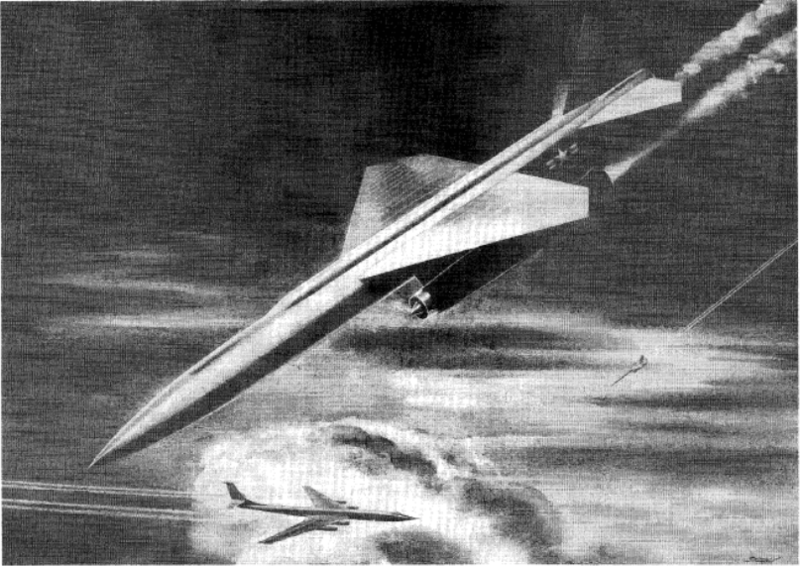 Unlike traditional missiles today the BOMARC had a large delta wing, reminiscent of the physical attributes of the 1950s and 1960s. The first variant, which was produced from 1955 to 1957, of the CIM-10 could reach speeds of approximately 2.57 Mach, (2.57 × the speed of sound) and had a range of 250 miles [FAS]. Improvements in lighter electronics and better thrusters nearly double the range of the second variant, as it had a range of 440 miles. During its production Boeing produced more than 700 missiles in total [Boeing]. The BOMARC itself could be mounted with conventional explosives or even nuclear warheads. Moreover, the BOMARC contained quite a few quirks. The propulsion system had a solid state booster rocket which was mounted with two ramjet engines mounted externally [Lombardi], by today’s standards this is considered to be poor design due to the layout and volatility of the fuel used in the propulsion system. The quirkiness of the BOMARC’s design almost ended in disaster when a nuclear tipped BOMARC caught fire on June 7th, 1960, at another BOMARC launch facility in Fort Dix New Jersey. The fire was eventually subdued and contained. Yet, the incident, now known simply as the “BOMARC Incident”, had a lasting impact on the program’s longevity or lack thereof [Porcelli]. Nevertheless, the CIM-10 BOMARC remained active for another 12 years, coinciding with the SAGE system. If the CIM-10 BOMARC is considered to be a marvel in the world of aerospace and mechanical engineering, then the SAGE system is the wonder in the world of electrical and computer engineering. The need for such an engineering marvel came when NORAD (North American Aerospace Defense Command) needed to create a centralized communications network mechanism in which all radar information would be shared amongst installations and corresponding authorities in the event of a bombing and eventually an ICBM (InterContinental, Ballistic, Missile). When considering the sheer size of the United States in conjunction with the number of possible attack approach courses the Soviet Union or enemies of the United States have, the ingenuity of the SAGE system is even more spectacular. The SAGE system is often considered to be the most expensive computer produced by IBM (International Business Machines). At $67 billion dollars (approximately $7.7 billion adjusted for inflation in 1954) it is not only one of the most expensive computers produced, it is also one of the largest [Sebastian]. Yet, this computer was not one, but rather twenty different computers located at different facilities across the continental United States. The computers used AT&T landlines and microwave towers to communicate with one another, a precursor to what would be considered today as dialup internet. Each of these computers were housed in massive concrete block shaped buildings, referred to as blockhouses. In addition, each of these facilities also had a generator system attached to it. The specifications of a single SAGE system computer were exorbitant. Each computer consisted of two CPUs which measured about 7,500 square feet each and had 60,000 vacuum tubes, 175,000 diodes, 13,000 transistors, with 256 kilobytes of RAM storage [Sebastian]. All of this required 3 megawatts of power and weighed 250 tons each. Furthermore, this was a time in which duel core processing was non-existent, thus the other CPU, was used as a spare, in case of a failure. Despite its overwhelming amount of hardware, the SAGE system was capable of executing 75,000 instructions per second. The SAGE system was truly the supercomputer of its time. The SAGE system would start its activity in 1963 and would remain active until it was decommissioned in 1984 [Sebastian]. While the SAGE system may not have helped in any real countermeasures against an attack by the Soviet Union, it was able to simulate the possibility of an attack. The SNORT (SAGE, Non-Real-Time) simulation had the ability to simulate the basic functionalities of the SAGE system. This was used to test both the abilities of the SAGE system, along with the readiness of the CIM-10 BOMARC itself [Ladd and Wolf pg. 36]. Furthermore, it was used to optimize the system and better its readiness. Up until the invention of the Intercontinental Ballistic Missile, both the SAGE system along with the CIM-10 BOMARC were the first line of defense against an attack by the Soviet Union. One of the major advantages, and one of the main requirements of the defense contract between Army Air Force’s Air Materiel Command and Boeing when creating the CIM-10 BOMARC, was a quick launch procedure in the event of an attack. The roof alone of the building housing the BOMARC missile could open in as little as 4 seconds, while the missile itself could be ready for launch in as little as 90 seconds. The short film “The Armored Sky” illustrates what would happen in the event of an attack by the Soviet Union, while the CIM-10 BOMARC itself could be launched in as little as 90 seconds [The Armored Sky]. However, the process of verifying and location of a potential airborne threat was initially picked up through the extensive radar apparatus. The presumed threat would then be extensively evaluated by a chain of command and further verified by other radar sensors and data produced by the SAGE system. Once the target was verified the SAGE system would then find an appropriate vector for the CIM-10 BOMARC missile to follow to intercept the newly evaluated threat. This vector was then transmitted to the corresponding BOMARC facility closest to the enemy target(s). After the targeting data was transmitted, the targeting vector of the enemy is loaded simultaneously during the loading procedure of the BOMARC missile. Once airborne the missile’s progress could then be tacked within a NORAD command center. Using radar guided technology, the CIM-10 BOMARC missile could then change its vector as it saw fit in order to intercept the target. Once honed, the BOMARC missile itself would then use its conventional high-explosive warhead or a nuclear warhead. At this point in American history nuclear weapons were used more as defense than a deterrent as the idea of Mutually Assured Destruction would not be a reality until the invention of the ICBM. Nuclear weapon with respect to the CIM-10 BOMARC were used more or less to destroy a large amount, if not all, of the enemy targets approaching Unites States airspace. In sense, this procedure, especially in a scenario involving the Raco Landing Field, was flawed and a bit comical due to the fact that the nuclear tipped missile itself would be launched over Canada, an ally United States. While the CIM-10 BOMARC missile, SAGE system and Raco Army Airfield did not play a critical role in the Cold War, or any United States conflict, its significance in history was one of many firsts. The technological advances made by BOMARC missile and SAGE system, were ground breaking for its time and led the way for countless other technologies, warfare related or not, to be developed. 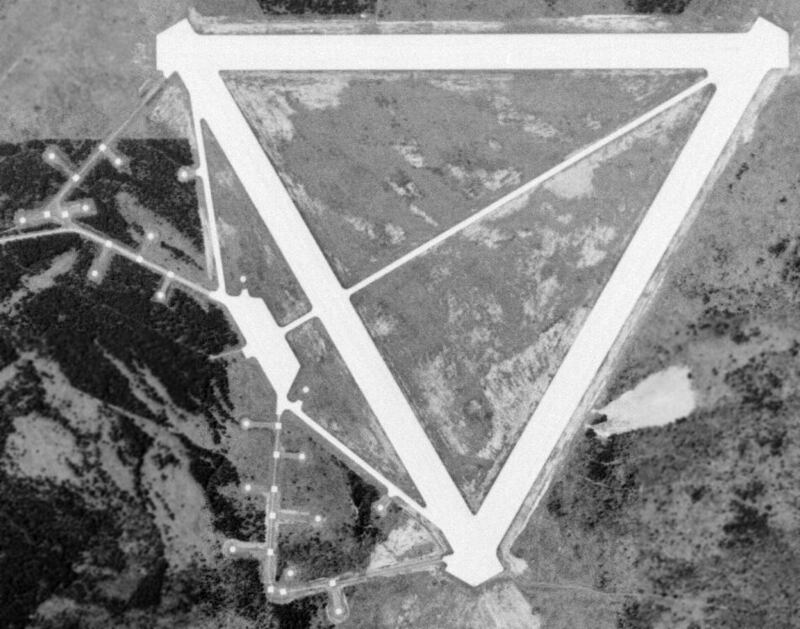 The Raco Army Airfield, may have only housed these missiles, but its role in NORAD’s defense network will forever make it significant in United States military history. The Armored Sky. North American Air Defense Command. (1961). Film. Porcelli, Richard. V. “Nuclear nightmare almost”. Airpower. Robert, Guttman. “The U.S. Air Force’s pilotless fighter: the Bomarc was a surface-to-air missile masquerading as an airplane.” Aviation History (2017). West, Pat. “The Word Storage Relay.” IEEE. AES Systems Magazine (1997). Sebastian, Anthony. “Inside IBM’s $67 billion SAGE, the largest computer ever built.” ExtremeTech.com (2013). Ladd, D. W. and E. W. Wolf. “A Non-Real-Time Simulation of SAGE Tracking and BOMARC Guidance.” IRE TRANSACTIONS ON ELECTRONIC COMPUTERS (1959). Office of the Inspector General (OIG). IM-99 Weapon System. Survey. San Bernardino: United States Air Force, (1958). Freeman, Paul. Abandoned & Little-Known Airfields: Northern Michigan. Federation of American Scientists (FAS). Boeing CIM-10A “BOMARC” – The United States Nuclear Forces. National Museum of the US Air Force. Boeing CIM-10 BOMARC. June 4, 2015. October 20, 2017. Canada Aviation and Space Museum (CASM). Boeing CIM-10B Super BOMARC. October 23, 2017. October 30, 2017. July 2, 2017. October 30, 2017.